Venla Hovi chipped in five assists over the weekend, earning her Canada West female third star of the week honours. 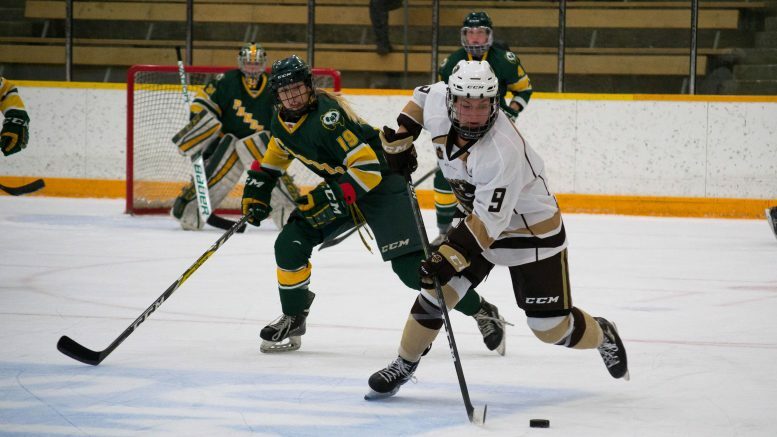 The University of Manitoba Bison women’s hockey team opened their season at home this weekend with a two-game split against the defending national champion University of Alberta Pandas. The Bisons dropped a 4-3 decision to the Pandas on Friday, but rebounded for a 4-2 win on Saturday. Manitoba now holds a 2-2 record and sits in fifth place in the Canada West. The Bisons played well on the powerplay and were even coming down to the final buzzer, but a last-minute goal gave the Pandas a 4-3 win on Friday. Down 2-0 in the first, Manitoba got on the board later in the frame on a five-on-three powerplay. Venla Hovi sent the puck to Alanna Sharman, who fired a slapshot on goal. 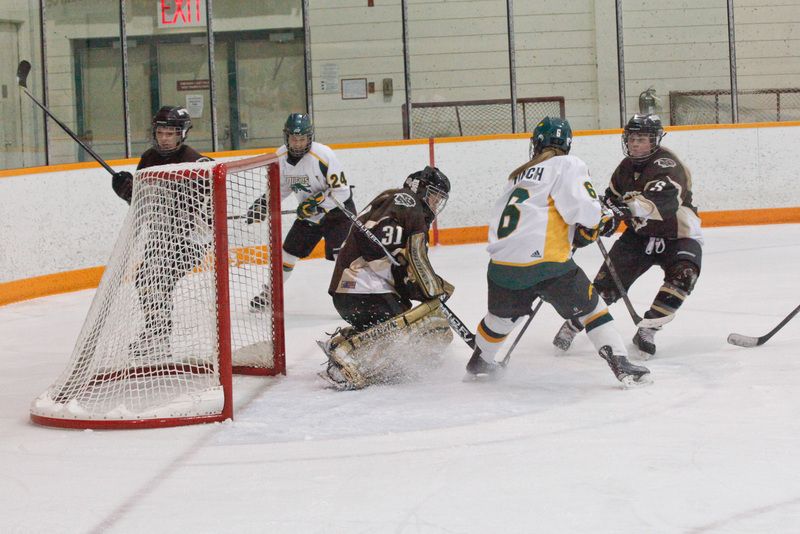 The puck was tipped in front by Lauryn Keen and past Pandas goaltender Dayna Owen, bringing the Bisons within a goal. In the second period, the Bisons powerplay struck again. Jenai Buchanan took a cross-ice pass from Hovi and hammered a point shot home, tying the game at two. Alberta got back ahead late in the second. The Bisons could not clear the zone and the puck found its way to the stick of Ashley Morin. She fired a shot from the high slot that snuck under Bison goalie Rachel Dyck’s right pad, giving Alberta a 3-2 lead. Another powerplay chance evened the game for Manitoba in the third. Hovi dropped a pass to Alexandra Anderson at the point. She walked in and ripped a wrister through four Bisons – and as many Pandas – past Owen’s glove and in. Hovi finished the night with three assists. Alberta came back to take the game off another goal by Boucher with eight seconds remaining. She walked in and ripped a shot over Dyck’s shoulder, giving the Pandas the win and spoiling the Bisons’ home opener. The Bisons were back on the ice Saturday night, ready to avenge their last-minute defeat by the Pandas the night before. Manitoba responded with a hard fought 4 -2 win, earning a weekend split. Manitoba jumped out in front in the first, again on the powerplay. Anderson sent the puck down low to Hovi and she set up Alanna Serhan for the tip, putting the Bisons up 1-0. The Pandas tied things up early in the second. Hannah Olenyk was left all alone and walked in, ripping a shot bar down on rookie Bison goaltender Lauren Taraschuk. The Bisons responded seconds later to regain their lead when captain Caitlin Fyten stepped up from the blueline and wired a shot past Owen’s foot, off the post and in. Alberta came back once more, knotting the game at two midway through the second. Amy Boucher snagged a loose puck and carried it behind the net for a wrap-around goal. Serhan nabbed her second of the game midway through the third. Just as a Bison powerplay expired, Serhan stepped into a heavy shot that flew past Owen to make it 3-2. Manitoba added another goal off an Allison Sexton breakaway and the Bisons took the game 4-2. Taraschuk picked up the first win of her career – and first as a Bison – turning away 20 of 22 Pandas shots and looked sharp throughout. Manitoba will be in Saskatoon for a series against the University of Saskatchewan Huskies on Oct. 19-20.